The discussion of Israel’s oil reserves gives me reason to discuss the rules that exist for reporting of resources and reserves of conventional oil. It is this oil that still dominates world production and it is production of this oil that has now reached peak oil and has slowly begun to decline. A bright future for increased production requires that we address production of unconventional oils and for those there are not yet any firm rules about how resources and reserves should be reported. As an example I can point to how the kerogen oil in Israel was compared with Saudi Arabia’s conventional oil without mentioning that the “tap” (flow) of kerogen oil could only be opened to a far lesser extent. “Modi’in Energy LP has published a resource report that revises upwards the best estimates of gross recoverable prospective oil and gas resources on the Yam Hadera license in the Mediterranean offshore Israel. Adira Energy Ltd., Toronto, has an option to purchase as much as a 15% participating interest in Yam Hadera until 14 business days before the signing of a rig contract for the license. Modi’in, in a public disclosure dated July 17, said consultants Netherland, Sewell & Associates Inc. estimated the prospective resources at 208 million bbl of oil, revised upward from 133 million bbl, and 3.4 tcf of gas, revised upward from 1.4 tcf. Geologic probabilities of success are 17-29% for different horizons. The report is based on reinterpretation of seismic data relating to the northern closure of the license, but there is no certainty that any resources will be discovered or commercial produced, Adira noted. Normally, a nation sells the rights to explore for oil in an area to a company or a consortium of companies. Seismic tests underpin the estimate of what they term “Total Petroleum Initially In-Place, PIIP”, i.e. that has lain there for millions of years. The first subclassification of PIIP is into “discovered” versus “undiscovered”. The oil that is discussed in the above article is thus “undiscovered PIIP”. The entire volume is regarded as “resources”. Part of this resource cannot be extracted (and the fraction is normally larger than the aria in the figure), but the remainder is a “prospective resource”. What Modi’in is saying is that their “best estimate” for the prospective resource is 208 million barrels of oil. The previously declared volume of 133 million barrels may have been a “low estimate”. One notes also that “there is no certainty that any resources will be discovered or commercial produced” and they make the judgment that “geologic probabilities of success are 17-29% for different horizons”. Thus, the decision to finance a drilling rig to look for oil is a bit of a lottery. If one drills and finds oil then the discovery is placed in the “discovered PIIP” class and as “sub-commercial” and “contingent resources”. Within contingent resources it can be subclassed at 1C, 2C or 3C. Eventually when all necessary test drilling is done to be able to produce the oil it is regarded as “proved reserves”. The reserves that are given in the “BP Statistical Review of World Energy” are usually 1P reserves. 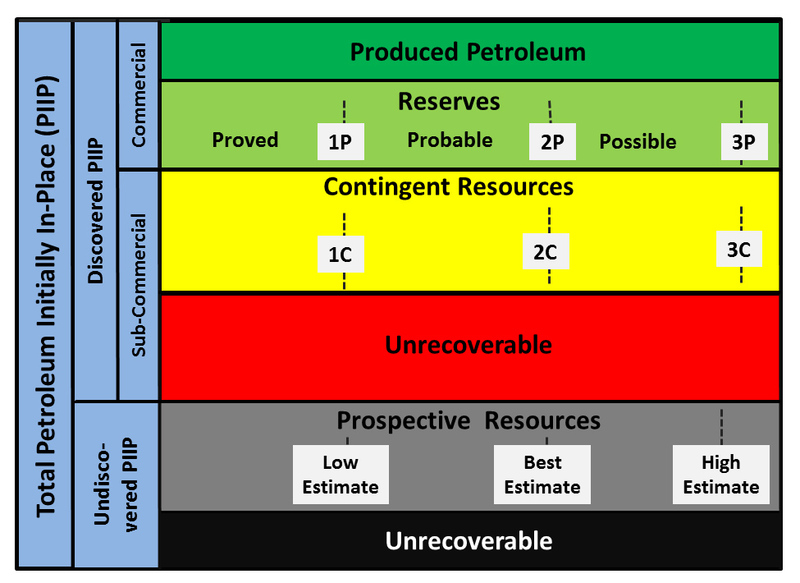 Today one can investigate a discovered resource sufficiently thoroughly to be able to estimate with good certainty the 2P reserves – proven and probable. The IEA, CERA, our research group and others usually normally discuss the future from the perspective of 2P reserves. When 1P reserves are discussed the investments for production of oil from these reserves are already in place while 2P reserves are still waiting for investment. When oil production actually begins depends partially on the price of oil and a company can make a revised estimate of 2P reserves if the oil price is high. The fraction Recoverable/Unrecoverable is called the recovery factor and this factor varies greatly between fields. Some years ago it was estimated that the average recovery factor over all of the world’s oilfields was 30%. Oil companies hope that new technology will raise this fraction which would increase reserves somewhat but the resources are already found. There are no agreed international rules regarding how one should classify unconventional resources and what we see is that the industry is trying to apply the rules for conventional oil to unconventional production. By doing this they can mislead investors that are not aware that the production volume per day from an unconventional reserve is much less than that from conventional reserves. Regarding reportage by the media, we see that they usually report large discoveries and the start of a project with large headlines. However, that the oil industry frequently drills dry holes does not normally make it into the news. It remains to be seen what reality will make of the news of the possible 208 billion barrels described above. If that volume was to be real it would be equivalent to the oil consumed by the world in 2.5 years. Diskussionen om Israels oljereserver ger mig anledning att diskutera de regler som finns för rapportering av resurser och reserver för konventionell olja. Det är denna olja som fortfarande domminerar världsproduktionen och det är produktionen av denna olja som nu nått Peak Oil och sakta börjar minska. En ljus framtid för ökad produktion kräver nu att man diskuterar framtida produktion av okonventionella oljor och där finns det ännu inga fastställda regler för hur resurser och reserver skall rapporteras. Det medför som exempel att Kerogenolja i Israel jämförs med konventionell olja i Saudiarabien utan att man diskuterar att den ”kran” som man kan öppna vad det gäller Kerogenolja är enormt mycket mindre. “Modi’in Energy LP has published a resource report that revises upwards the best estimates of gross recoverable prospective oil and gas resources on the Yam Hadera license in the Mediterranean offshore Israel. Adira Energy Ltd., Toronto, has an option to purchase as much as a 15% participating interest in Yam Hadera until 14 business days before the signing of a rig contract for the license. Här rör det sig om konventionell olja och vi kan nu studera var denna olja skall placeras i det regelverk som industrin skall använda och reglerna finns sammanfattade i den bild som jag precenterar här. Normalt brukar ett land sälja rättigheterna att leta efter olja i ett område till något bolag eller ett konsortium av bolag. Seismiska undersökningar ligger till grund för bedömningar av det man kallar för ”Total Petroleum Initially In-Place, PIIP”, det vill säga det som lagras under miljontals år. Den första uppdelningen av PIIP är det som man hittat respektive inte hittat. Den olja som diskuteras i artikeln är således ”undiscovered PIIP”. Hela volymen kallas för ”resources”. En del av denna resurs kan min inte utvinna (normalt större än vad ytan anger), men kvar blir en prospekterbar resurs. Vad Modi’in sager är att deras “best estimate” nu är 208 millioner fat olja. Tidigare angivna volym 133 millioner fat kan ha varit en ”low estimate”. Man noterar också att ”there is no certainty that any resources will be discovered or commercial produced”, och gör bedömningen att “geologic probabilities of success are 17-29% for different horizons”. Att gå in och finansera en borrigg för att leta efter olja är således lite av ett lotteri. Om man borrar och hittar olja så placeras fyndigheten som ”discovered PIIP” och som ”sub-commercial” och klassas som ”contingent recources” och här finns det möjlighet att klassa den som 1C, 2C och 3C. Så småningom har man gjort alla nödvändiga borrningar för att kunna producera olja och då har vi ”proved reservs”. De reserver som anges i ”BP Statistical Review of World Energy” brukar för det mesta rapportera 1P reserver. Idag kan man undersöka en hittad resurs så väl så man kan med god säkerhet ange 2P, proven and probable. IEA, CERA, vår grupp och andra brukar normalt diskutera framtiden utifrån 2P. Då man diskuterar 1P finns investeringarna för produktion gjorda medan 2P väntar på finansering. När i tiden produktionen kommer igång beror delvis på priset på olja och ett bolag kan böra en ny bedömning av 2P om priset är högt. Kvoten Recoverable/Unrecoverable kallas recoverfactor och denna faktor varierar stort från fält till fält. För några år sedan var bedömningen att medelvärdet för alla världens fält var cirka 30%. Bolagen hoppas att ny teknik skall öka denna kvot vilket kommer att öka reserverna något, men resurserna är redan hittade. Det finns inga internationellt fastställda regler för hur man skall klassificera okonventionella resurser och vad vi ser är att man försöker använda reglerna för konventionell olja för ickekonventionell olja. Genom att göra det kan man vilseleda investerare som inte är medvetna om att produktionen per dag från en okonventionell reserv är mycket mindre jämfört med produktion från en konventionell reserv. Vad det gäller medias rapportering så brukar man rapportera början av ett projekt med stora rubriker liksom ett verkligt fynd. Att man väldigt ofta borrar en torr brunn når normalt inte ut till pressen. Det återstår att se vad den rapporterade nyheten om möjlighet att hitta 208 miljoner fat kommer att bli i verkligheten. Skulle det bli verklighet motsvarar det världens konsumtion under två och en halv dag. Detta är inte nytt, se http://en.wikipedia.org/wiki/Oil_shale_in_Israel . Såsom Kjell påpekar handlar detta om “Kerogenolja” (oljeskiffer) och hur mycket av detta, som går att utvinna får väl framtiden utvisa. Det står olika siffror i denna artikeln också. 150 miljoner i referatet till oil and gas, 150 miljarder (2.5 år av oljebehovet) i engelska versionen av slutklämmen och 150 miljoner (2.5 dagar) i svenska versionen. Så vad är det som gäller egentligen?